From a 2800-foot elevation water tumbles down the canyon side at 250 cubic feet per second, makes Niagara Springs is a sight you won`t soon forget. The rolling water is the cool blue of ancient glaciers. The springs themselves are a National Natural Landmark and part of the world- famous Thousand Springs Preserve along the Snake River. The 110-acre park provides your best opportunity to drive into the 350-foot-deep Snake River canyon, but be cautious, as the road is narrow and steep. Once inside the canyon, you will find year-round fishing in Crystal Springs Lake, including a handicap accessible site. Wildlife, especially waterfowl, is abundant and a group picnic shelter is available. People pass the 652-acre Malad Gorge State Park in the blink of an eye, never suspecting the spectacular canyon views that await them just a mile off the highway. Malad Gorge is open for hiking, picnicking and day outings. The Malad River crashes down stair step falls and into the Devils Washbowl; then cuts through a beautiful 250 foot gorge on its way to the Snake River, 2-1/2 miles downstream. Views of the gorge are best from the sturdy bridge that crosses the canyon. You can take a short hike to discover nearby fingers of the gorge where crystal-clear springs produce ponds and streams. 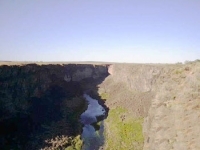 Malad Gorge is located just east of Hagerman. Guided tours can be arranged by calling the park. Fishing, bird watching, hiking, hunting, and photography are just a few of the things visitors can do at the Hagerman Wildlife Management Area (WMA). Located four miles south of Hagerman on Highway 30, the 880-acre WMA is a hot-spot for local wildlife, and outdoor fun. The Hagerman Wildlife Management Area was the first wildlife management area in Idaho. Originally established to provide habitat for waterfowl and upland game birds, over the years it has turned into much more. The Idaho Department of Fish and Game purchased 423 acres of land in 1940; since then it was expanded to its current 880 acres. Today, the Hagerman Wildlife Management Area surrounds both the national and state fish hatcheries, with the balance of the property devoted to wildlife. Spring fed ponds stay ice-free during most winters, attracting as many as 55,000 ducks and 4,000 Canada geese. Riley Creek, irrigation canals, and 16 constructed ponds provide resting, feeding, and nesting areas for a variety of waterfowl.